If you’re opening a new office, or you’re adding new staff to your existing business, you have probably noticed how expensive office furniture is. You know you need to give your employees adequate work space, but adding work space should also be affordable. The truth is, you don’t have to buy a whole new suite of office furniture to provide more space for your employees. 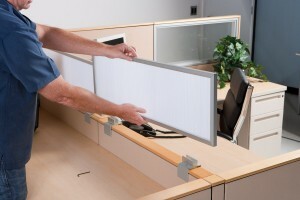 With table mount panel extenders, you can create instant cubicles. You don’t need a special type of table to create a functional cubicle, in fact, any table you have that’s between ¾” and 2″ thick will be just fine. As long as it’s sturdy enough for your staff to do their work on it, you can add a table mount panel extender. Don’t have a spare table? You don’t even have to go out and buy one. Consider renting tables if you only need them temporarily. Table mount panel extenders won’t do any damage to them. Your time is valuable and the last thing that you want to do is spend it putting together furniture. In a matter of minutes, you can install table mount panel extenders then you can get back to work. You won’t need an engineering degree or a giant box of tools to get the job done either. They come with a thumb screw and an allen wrench and that’s all you need. They’re so easy to install that anybody can do it with no trouble at all. In business, you’ve got to be agile enough to change and your furniture has to be versatile too. Whether you want to use a single table against a wall, or two tables back to back, table mount panel extenders are the answer. You can install one set along the edge of the table, to create a center divider and others to divide the table into work spaces. Even better yet, if you ever want to change the configuration, you can do it nearly instantly. If you only need cubicles for a short amount of time, or if they’ll be a permanent fixture, table mount panel extenders are the solution. Instantly install them for temporary employee testing desks or training centers. Take them down, store them flat in a storage cabinet and pull them out again when they’re needed. Or, just leave them in place and they’ll hold up to daily use for years to come. Your business image is incredibly important and the last thing you want is to have furniture that looks like it was haphazardly thrown together. Table mount panel extender frames and panels come in a large variety of colors to perfect match any office décor. You can also choose the material for your panels, from fabric acoustical tiles to polycarbonate and either clear or frosted acrylic. If you would like more information about table mount panel extenders, please contact us. Our friendly staff will be happy to answer any questions you have. We’ve helped many businesses, just like yours, and we’ll be happy to help you choose the best option for your users.